Landscape lighting plays a significant role in making your exterior space an inviting place to spend a romantic evening. Blooms Landcare can install outdoor lights in strategic areas of your landscape design to enhance the beauty of your outdoor space. Try these “bright” ideas for the perfect backyard environment! Using outdoor lighting in your backyard space is the easiest and most cost-effective way to highlight the features of your garden or landscaping that you want seen. Depending on the lights that you choose, you can also set a specific mood for when the sun goes down. 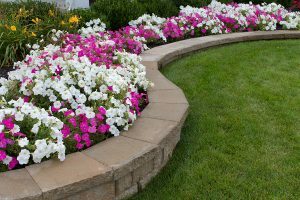 The professionals at our Fort Worth landscaping company can easily guide you through the design technique referred to as layered lighting. Layering the lights on your deck, in your garden, or as a part of any landscaped area creates an atmosphere filled with serenity and romance. But there’s no point in landscape lighting if you have nothing to illuminate! Our landscapers are experts in their field and can help you choose the best plants for the space you wish to create. Whether you’re looking for shady trees, pops of crazy color, or anything in between, we can help you. But you can also add more than just plants to create the perfect romantic landscape. Placing a comfortable bench or a bistro set in a softly illuminated garden provides the ideal place for intimate conversation and romantic dining. Adding an outdoor bed or double chaise to your landscape design is a also certain way to add romance to your landscape and will look great on an enlarged or covered patio. Water features are also great in any landscape design. Adding underwater or submerged lighting to a water garden will softly illuminate any plants and fish in the water garden. Plus, the sound of lightly bubbling water is instantly soothing. An evening picnic beside of a lighted water garden would be extremely relaxing and wonderfully romantic. Once you have created the perfect outdoor retreat, you will certainly want to spend time there. One way to enjoy your romantically designed outdoor area is to designate one evening a week as a night for a romantic dinner or picnic under the stars with that special person in your life. Be creative with your plans! Have a gourmet meal on the patio, enjoy a picnic in the garden, or have a wine and cheese night under the stars. But remember to keep it simple so that the focus remains on the romantic aspect of the evening. Make a call to Blooms Landcare at (817) 688-5352 and let them assist you with simple landscape lighting that will make it easy for you to enjoy many tranquil, serene, and romantic moments right outside your door.